This pre-settable AC/DC hour meter features a 6 digit LCD with self-powered CMOS circuitry. The hour meter can be pre-program using the terminals. The total accumulated time is always displayed. Features a 7 digit LCD display with self-powered CMOS circuit. These units are powered by an internal lithium battery. The hour meter can be with and without external electronic reset. This hour meter features 5-digits with an hour glass icon as a running indicator. Unit has three separate timers, and two vibration sensitivity settings. Features a 7 digit LCD display with self-powered CMOS circuit. These units are powered by an internal lithium battery. The totalizing counter can be with and without external electronic reset. 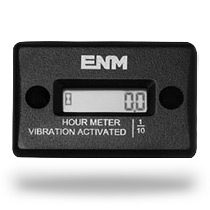 This meter operates only when it is introduced to vibrating equipment and can be installed anywhere on equipment with no special wiring connection or power source to operate. A low cost, reliable hour meter incorporating the latest state-of-the-art in electronics. It’s quartz-crystal time base insures accurate long term time-keeping. 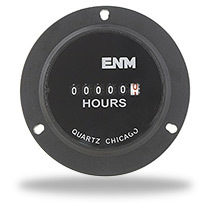 ENM Company is proud to have a product line that covers almost any counting or timing application. We can also modify any existing standard design to accommodate your needs. 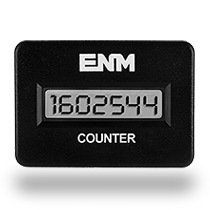 With ENM as a supplier, you will have the highest quality, quickest delivery, and the expertise of over 60 years of experience as an OEM supplier of counters and hour meters on your side. And we’re ISO 9001:2008 certified. 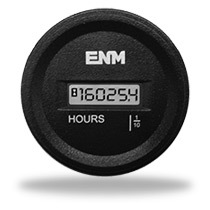 This year marks the 60th anniversary for ENM Company, a worldwide manufacturer of various counting and timing instruments based in the United States. 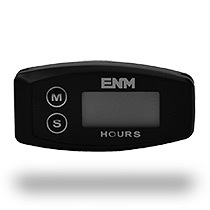 ENM’s Series TB45 is a pre-settable AC/DC hour meter. It features a 6 digit LCD with self-powered CMOS circuitry.